This is one of the few times when you’d want to use “git rm –cached “ to un-add a changes in the index. After the first commit the recommended way to un-add changes to the index (staging area) is to “git reset HEAD “. Note that the only file that is edited during this process is .gitignore When you call “git add” you are adding the current content of a file to Git to the index. If you change a file after you add it Git won’t commit the additional changes (unless you add them too). So, it’s a good idea to run “git add .gitignore” just before you commit in order to make sure Git has the most recent version of it. You’d only, obviously, “add” files you wanted. “git add .” (note the dot) tells Git to add everything in, and below, the current directory. This image is copyright 2008 Very Useful Books, Inc. and distributed under the GPL v2. It was created With OmniGraffle 4. If anyone wants the original, just holler. [Update] P.S. 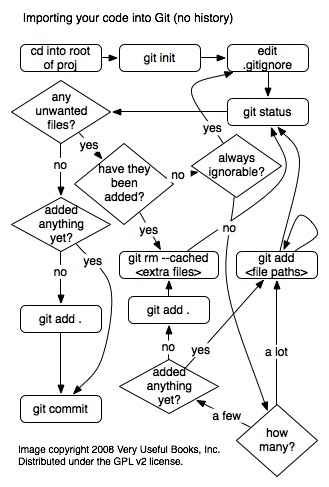 It’s just a matter of time before someone tries to use this as evidence that Git is complex or hard to use, but before you do, please do an equivalent flow chart for your version control system that includes ignore files, adding selected files, adding all files, removing accidental adds, and everything else. You’ll find your chart is just as “complex”. The shortest path here is only 4 commands and that includes setting up the new repository to check the code into, and an optional sanity check of what’s going to be committed.